This weekend fighting game players and fans around the world will be tuning-in to the live streams for Evolution 2016. As mentioned previously this is a huge event for the global FGC with players from around he world converging in Las Vegas, USA to crown this year’s Evo champions. Below we have a summary of links people can check for information and live updates about Evo 2016. After the jump we also have embeds of all of the official Evo stream channels. Be sure to make some noise in the official AU FGC Facebook page to share the hype with the Australian scene as we cheer our players and favourites. Official stream schedule (AEST and AWST time zones). List of Australians competing at Evo 2016. Reddit r/StreetFighter mega-thread for Evo 2016. Look-up site for data in the official brackets. Hit the jump for the official stream links. Evolution 2016, the largest open-entry fighting game tournament in the world, is taking place this weekend in Las Vegas, USA. Players from around the globe will converge to determine this year’s Evo champions across 9 official tournament games. 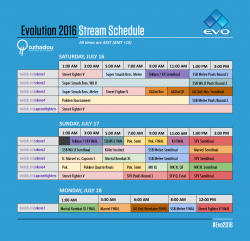 Evo 2016 is also the largest event in the Capcom Pro Tour with over 5,000 competitors for Street Fighter V alone. The tournament organising body Shoryuken has announced the official stream schedule for Evo 2016. Below we’ve taken the Las Vegas times and converted them to AEST and AWST for the convenience of Australians looking forward to watching the tournament over the weekend. We also have a summary of Australian players competing at Evo 2016 and you can also check out the official brackets online. Historically these have been slow to update so we’ll also provide links to the latest updates on Eventhubs and Shoryuken once these are available, along with embeds of all the official Twitch channels covering Evo 2016. “That’s right ladies and gentlemen, get in the fighting spirit and watch the biggest fighting game event of the year with all of your friends in the Melbourne Fighting Game Community! CouchWarriors has partnered with ACL Melbourne to provide a fantastic weekend of Evo, casuals, fun tournaments and silly games. Bring yourself and your friends and set yourself up in front of the big projector screen to see all the action go down while playing, practicing and supporting your Australian troops going over to try for the crown! That’s not all though, we’ll have prizes to give away throughout the weekend courtesy of our sponsors. We’ll be giving away a Qanba Q4RAF Arcade Joystick courtesy of http://www.gaminggear.com.au/ and Gaming Gear will even have a table on site selling sticks, buttons and more! We’ll also have a heap of vouchers and DVDs courtesy of Madman Entertainment to keep you thoroughly entertained, and even more to be announced in the coming weeks. This fee includes entry to any tournament you wish to be in (except for the Smash tournaments). We’ll be taking a bit of a different approach to tournaments for the weekend. As everyone will be glued on the action throughout the day on the big screen we’ll be running alternative rules to normal tournaments. We’re toying with the idea of less “serious” and more fun tournaments such as teams, random, low tier and many others, but we’d love your suggestions. Got a format you think would be fun? Please suggest it. The current plan is to run Armies on Sunday for each game. This involves splitting all the competitors into two teams and having them play off against each other while their team cheers them on until only one is left standing.